Could 3D Printing Really Disrupt the Promotional Product Industry? Home / Promotional Products / Could 3D Printing Really Disrupt the Promotional Product Industry? A regular printer puts words and images onto paper, but a 3D printer is so much different. It sculpts an object right before your eyes, using laser and a computer. It can work quickly enough that it’s even faster than molding. There also seems to be almost no limit as to what you can print; you can create pretty much anything you can dream of. While 3D printers are becoming much more prevalent, they’re still uncommon enough that they work very well as a promotional tool. Have one in your shop or your trade show booth, and you can quickly elevate the high-tech reputation of your brand. 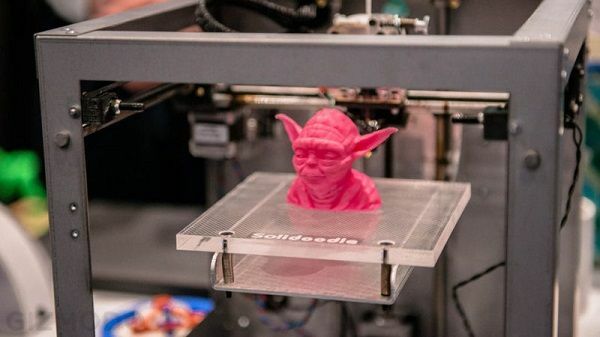 But the importance of 3D printers isn’t just about what they are, but what about what they can do to really promote your brand. They can become so effective at it that they can very well disrupt the entire promotional industry. Here are some effects of 3D printing that can alter the promotional products landscape. Instant promo products. Now you won’t have to look for a company to provide you with the promotional items you want, and you won’t have to wait for an order to arrive. Have a 3D printer to your shop or at an event, and you can quickly produce a promotional item whenever you need one. Never run out of promo materials. As long as you have the materials needed to produce your items, you basically won’t ever run out of stock. So you can produce these promo materials to meet the demand precisely. There’s no need to sheepishly tell customers that you don’t have any promo items for them. There’s also no need to lug around cartons of your promo items, and if your promo items aren’t popular you don’t have too many items just lying around. Build the promo items on site. It’s a seriously fascinating process, and it can enthrall your potential clients so that in their eyes your brand reputation rises. Customisation is much easier. You can just make minor changes to the program to change any feature in the promotional item. You can make it a bit bigger, or change its colours. You can change the text on the item. Customising products can be very expensive when done the traditional way, because you’ll need special molds. But with 3D printing, it doesn’t add much to the cost. You can then please your clients by accommodating their requests. Track the most popular promo items. Since you can produce several different kinds of promotional products, you can find out which one of them are the most in demand. You can even track the most popular colors for promo items. Design your own promo items. Now you’re no longer limited by what promo product manufacturers can make. You can make your own, so you generally have your own promo item manufacturing department. As you can see, the promotional product industry will undergo a paradigm shift once 3D printing becomes more popular. Who needs 3rd party manufacturers, now that you can make your own promotional items? – Not everyone wants to be involved in this process and most still prefer to outsource these products. For those that want to make promo products themselves or companies adding new techniques to make products, 3D printing represents a very exciting revolution but certainly not a game changer! Time will tell so look out!